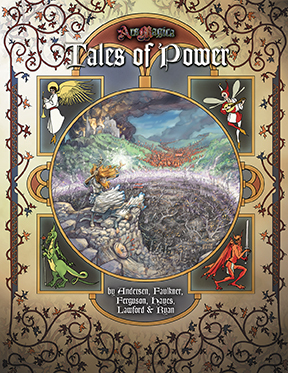 Tales of Power was released in mid 2013, so I can freely comment on its contents. I wrote only a small part of this book – I really just helped Mark Faulkner (aka the Berklist’s Marko Markoko) with his high-fantasy adventure “The City of Brass”. This amounted to consulting on some of the jinn concepts, working out some of the metaphysical mechanics of the Brass Bottles and straightening out the relationship between the various regio layers that the players traverse on their journey. Addit (early 2016): with the recent publishing of Lands of the Nile, the sourcebook for Egypt, there is now material on Cairo (Chapter 6) and the Siwa Oasis (Chapter 10) that can tie in well with the adventure as well as details in Chapters 1 & 2 about playing Egyptian characters and hedge wizards that may enrich the experience. I may follow up with my specific thoughts on the writing process at some stage, but here is some additional material left-over here from the City of Brass drafts. The first was cut because of the complexity of adding a Faerie version of the tale given the need for extra mechanics. The second reflects the original ending to the tale but was dropped to save space. This additional article is an item I developed for Vaults of the Order, a concept Timothy Ferguson had unique Hermetic and non-Hermetic items that he started back in 2015 that unfortunately never generated much enthusiasm. I contributed this item – it’s essentially an unusual Brass Bottle that could be fitted into the main adventure arc as a side plot.